Easter would not be Easter without gaggles of children screaming and racing around hunting for their Easter baskets which today may contain, along with the standard colored eggs and chocolate items, small gifts such as PlayDough, Hot Wheels, Dora or Elmo. Even older children and teenagers enjoy finding baskets containing gift cards, CDs, DVDs and, of course, chocolate. Trying to think of new places to hide the baskets and new ideas to keep the event fresh and exciting every year can prove a challenge to the event planner. According to old German legend, Eostre, an old German fertility goddess had her companion “Lepis” lay colored eggs one day a year for the local children to find. Eggs were a treat since the children were not allowed to eat them during the six previous weeks of Lent. The tradition came to the Americas in the 1700s when the children of the German immigrants would add straw to little hats and boxes to create little nests and hide them throughout their homes the night before Easter. They hoped that on Easter morning, they would find the nests full of colored eggs. The traditional straw nests have become baskets of every conceivable shape and size. 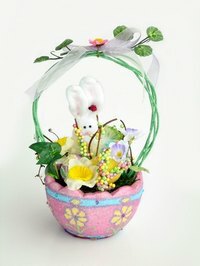 Baskets made out of vinyl, wire, cloth or wicker range from the small, bunny-shaped, plush baskets for baby's first Easter, to character themed baskets, such as Barbie or Spongebob. The basket will be long cherished if the Easter Bunny takes into consideration the interests of the basket finder. Also, the type of basket may direct the planner to create games and hiding places associated with the basket theme. Finding new places to hide the basket becomes more challenging as the finder gets older. Those first few years prove quite simple since the little one has no real “finding” abilities. Hiding the basket practically in plain sight will suffice for the early years. Some ideas for hiding places include with his toys, right beside the bed or on the floor in the kitchen where she will see it when she comes in for breakfast. As the child gets older, place the basket in places that will not be difficult for the child to find. After all, Easter is not a time for frustration. In toy boxes, behind furniture and under beds do quite nicely for a few more years. The child only wants to find it quickly and get to the candy. When the child reaches eight or nine, the Easter Bunny gets craftier in hiding the baskets. Now the baskets go into places that the child rarely goes. In the laundry room, the baskets go in the washer or dryer. In the kitchen, they can be found under the sink, in the oven or inside a cabinet. If the basket has a Barbie theme, hide it in the Barbie playhouse. However, if the child cannot find the basket within about 10 minutes, play the “Warmer/Colder” game where the parents tell the child if he is getting closer to the basket by saying “Warmer” and “Hot” when he is nearby. If he goes away from the hiding spot, the parents say “Colder” and “Cold” if he continues getting farther away. When the child no longer believes in the Easter Bunny tradition but still wants the small presents, candy, toys, eggs and other goodies, the Easter Bunny can really get creative. Now the rules regarding hiding the basket are off, and the basket can be hidden anywhere. The more elusive the hiding place, the better. Good places require the young person to search for hours if necessary: in the garage behind the garden hose, in the back seat of the car, up in the attic, in the back of the closet he has not cleaned out in months, or at the bottom of the overflowing clothes hamper. Put it behind the bag of dog food, especially if the young person’s chore is to feed the dog. A truly devious Easter Bunny will be on the lookout for great hiding places throughout the year. Having games to play while hunting for Easter baskets make the event more challenging and will keep the child’s interest up during the time it takes to find the prize. Leaving the end of a piece of yarn or heavy string on the child’s bed that leads the child all around the house and finally to spot where the yarn is tied to the basket keeps the child occupied for a time. A treasure hunt with pieces of paper in plastic eggs, each with a clue to where the next egg is hidden begin with a large colored egg placed at the foot of the child’s bed. A small stuffed bunny in the egg which is on the bed can be a companion to the basket hunter as she goes from egg to egg, finding the clues until she gets to the basket’s hiding place. Another game for those children who may not yet be reading, is to hide the eggs as before, but instead of having a written clue in each egg, provide a piece of a puzzle. When all the puzzle pieces are found, the child (with parent’s help if needed) puts the pieces together to have it reveal a picture where the basket is located.